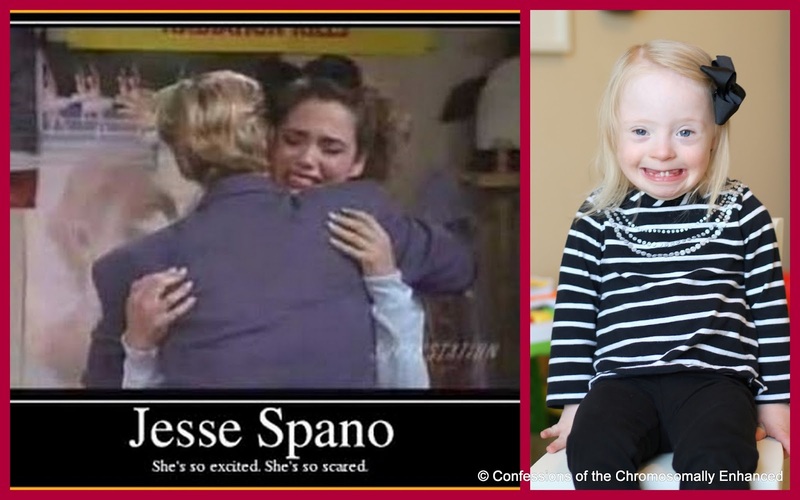 Confessions of the Chromosomally Enhanced: We're so excited...we're so excited!!! We're so excited...we're so excited!!! It's been two and a half years in the making and the level of excitement in this house is palpable (especially since we have PT this afternoon). In her trademark two-year-old perpetual state of defiance, any urging to "walk" has been met with a resounding "no!" So since walk has become a four-letter word in our house, this morning, we decided we would "run" instead - and it WORKED! The absolute best moment of this whole video is the impromptu Jessie Spano freak out, "I'm so...scared!" It couldn't have been any better if it were scripted (but I promise it wasn't). Seriously, people, if you don't get this reference, you're not a child of the 80's! We're so excited...we're so excited!!!! Ok I really did the happy dance...Go Josies!!! YOU TOTALLY ROCKED! Congratulations on your new journey of walking or should i say "running." GO JOSIE!!! and WOW is she talking! All BIG and EXCITING things! Yay Josie! You are awesome! Hooray!!! That was so awesome. Congrats Josie! Way to go Josie! Seriously bawling my eyes out here at my desk at work :) So happy. I have the biggest smile right now. Wow, Josie! Keep on running!!!! Oh my gosh, I was so excited too! Hearing her express being 'so scared' was amazing, I kept cheering her on! Way to go Josie! You go girl!!! Doing a little happy dance over here for you! Wooohooo! She's so awesome!!! and impossibly adorably perfect - I just can't get enough of her. She is so cool. GO Josie Jo Jo, Go!! I can't wait to see her perfect this awesome skill and ability!! She's a rockstar. LOVE the SBTB referrence. Josie and Jesse HAHAHA. Good job Josie! PS I saw Jesse aka Elizabeth Brinkley yesterday at Beverly Hills Farmers Market. Random! Josie, you go girl - scared, but smiling the whole time! And I'm sure it's just my pregnancy, but the mommy kisses at the end brought tears to my eyes. Very healthy to verbally express her feelings. I'd be scared too if I had Jesse Spano's hair. Oh . . . wait I think I did back in the day.